You have added Lacey High Low Sheath Dress in Blue into shopping cart. This lace cocktail dress is striking! The Lacey High Low Sheath Dress has a beautiful lace overlay with a contrasting off-white liner. The color combination makes the blue color pop! The dress is a sheath cut, has capsleeves, a high low hemline, and an open-back. The dress is lined at chest and skirt area. 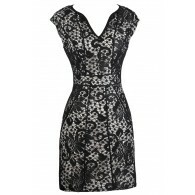 The back is cut-out with semi-sheer lace that comes to a button closure. The bust and hemline have delicate eyelash lace detailing that we love. This dress is semi-sheer; a slip is recommended. A hidden back zipper on the attached skirt completes this dress. This cocktail dress is perfect to wear on a date night or a dinner party. Add heels and delicate jewelry to complete your look. Details: Lined at bust and skirt. Hidden back zipper. 100% polyester. Wash dark colors separately. Small measurements: Length from shoulder to hemline: 32”-39”. Bust: 32”. You have added Lacey High Low Sheath Dress in Blue into Wishlist. 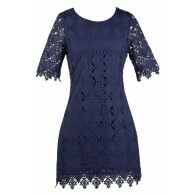 You have added Lacey High Low Sheath Dress in Blue for Stock Notification. You have set Lacey High Low Sheath Dress in Blue as a loved product. You have removed Lacey High Low Sheath Dress in Blue as a loved product.